I am interested in understanding how the beating rhythm of the heart is developed within each of the muscle cells within the heart. While it has long been known that ion movements across the cell membranes of heart muscle cells produce the electrical currents that produce heart rhythm, it is only since 2005 that it has become recognised that the movement of calcium ions within muscle cells forms a clock that sets heart rate. Malfunction of this calcium clock produces heart arrhythmias that result in sudden cardiac death. My research group is studying the pathways that allow calcium to move within heart muscle cells. Of special interest to us are the calcium release channels (called ryanodine receptors, RyRs) that permit calcium to be released from intracellular calcium stores. Our experimental approach is to isolate these calcium release channels from hearts and incorporate them into artificial cell membranes (called lipid bilayers). We then measure the calcium flow through individual channels and how it changes in response to the various stimuli that would occur in the heart. We are investigating how calcium release channels are controlled within the cell by substances such as calcium itself and regulatory proteins such as calmodulin and protein kinases. We endeavor to understand how mal-regulation of calcium release channels leads to heart arrhythmias. Mutations in calmodulin are known to cause heart arrhythmias and we are now measuring how these mutations lead to an increase in the activity of calcium release channels. We are trying to understand how some inhibitory drugs that decrease the activity of calcium release channels can prevent heart arrhythmias yet other inhibitory drugs exacerbate arrhythmias. I have always been intrigued by how the universe functions. The function of living organisms is particularly interesting to me because of their complexity. I have focused on the mechanisms of heart rhythm because they seem to emerge from relatively simple physical processes that are embedded within every cell in the heart, yet it is still not understood how they work together to establish heart rhythm, how they can be disrupted by heart disease or inherited mutations or how heart rhythm can be restored by therapies. I am very curious to understand this. My end goal is to understand how heart rhythm is regulated and why it goes wrong in heart disease. I would like my research to form the knowledge base for the development of therapies to reliably prevent heart arrhythmias. My future focus is to develop a comprehensive theory for calcium signaling in the heart and how it sustains heart rhythm. In 1995, when Professor Derek Laver entered the medical research field, there was very little understanding of how calcium release channels (called RyRs) were regulated by calcium and magnesium within each cell of the body. He was the first to identify that calcium in the body can inhibit cardiac RyR type 2 channels and he also characterised a dual mechanism for magnesium inhibition in a part of a heart cell called the cytoplasm. Professor Laver also discovered that a disruption in magnesium inhibition due to mutations could lead to malignant hyperthermia, a life-threatening condition that affects a patient's ability to regulate their body temperature when receiving certain anaesthetics. Several other major discoveries were made over the next few years including finding the protective effect of omega 2 fatty acids on heart muscle RyRs. This work culminated in the first measurable theory of how RyRs can regulate calcium release under the influence of calcium and magnesium. Professor Laver's recent research aims to better understand how the properties of single RyR2 channels are linked to contraction and rhythms in the heart. To this end, he has developed the first 3D computer model of the heart that reproduces the time-course of calcium release phenomena (calcium sparks, calcium blinks and calcium spark restitution). Within the University of Newcastle he is coordinator for the Cardiovascular RQF and represents the Hunter Region on the NSW Cardiovascular Research Network. He is a reviewer for many international journals (eg Journal of General Physiology, Biophysical Journal) and for the funding bodies ARC, NHMRC and Wellcome trust. 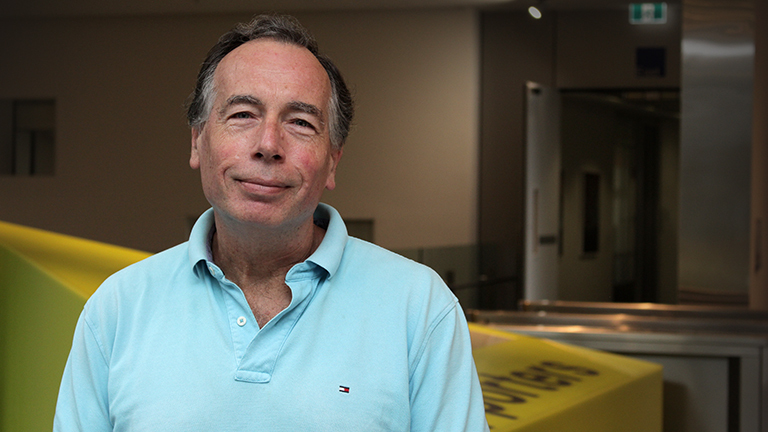 Professor Laver served as a member on peer review panels in Australia and internationally. His research has attracted a number of highly prised fellowships from the ARC, including a Queen Elizabeth II Fellowship, Senior Research Fellowship and a Professorial Fellowship and also a Brawn Senior Fellowship from the University of Newcastle. The theme of my career is the use of biophysical methods to study ion channel function. I am an expert with both lipid bilayer and patch-clamp techniques. I have accrued considerable expertise in single channel recording and modeling of ion channel conductance and their regulation by ligands.